government in retaliation for claims made by her husband, former US diplomat, Joseph Wilson (Sean Penn). In 2002, Wilson had been tasked by the CIA to visit Niger in order to discover if Saddam Hussein had attempted to buy nuclear materials in the country. He found no evidence of this attempt. However, the US government ignored his findings and used the attempted purchase as one of the grounds for a potential invasion of Iraq. Wilson could not stand by and watch the US government use incorrect intelligence information as a basis for war. As a result, he wrote an article for The New York Times called “What I Didn’t Find In Africa”. In an attempt to discredit and silence Wilson, the US government leaked Valerie’s identity to Washington Post journalist Robert Novak. This act ended Valerie’s career in the CIA and also put her, her family and her contacts in danger. 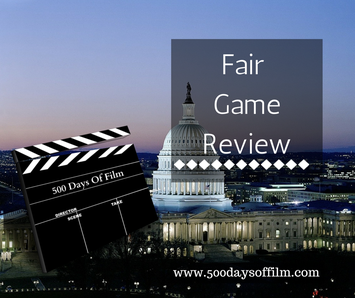 Fair Game tells a story that you just can’t believe could be true. The fact that the US government was willing to use dubious intelligence to justify a war still remains unbelievable. In addition, the ways the government tried to silence its critics, well let’s face it - this is all terrifying. The film starts by showing us how respected Valerie Plaume was and how her career was on an upward trajectory before she was outed. There is great development of both her role at the CIA and her life at home as a wife, mother and friend. Naomi Watts is excellent in her portrayal of all sides of Valerie. Sean Penn is excellent (if larger than life at times) in his role as Joseph Wilson. His character is put in an incredibly difficult position - where should his loyalties lie? You also get the sense that he is revitalised by the challenge in a way that Valerie is not and this puts a tremendous strain on their marriage. Should he stand up for what is morally right or should he stay quiet in order to protect his family? Click here to read Joseph Wilson's What I Didn't Find In Africa article. Once again (as was the case with The Fighter) the films ends with footage of the real people involved. And once again, I do not mind this at all - in fact I find it fascinating.